I came across this one on Pinterest, but added some personal touches to the original recipe, hence will post my version for your enjoyment. This dish stays delicious for few day, but it presents itself the best when freshly baked. Place oats and quinoa in a sieve, rinse it under cold running water, stirring continuously, until the water runs clear. In a medium mixing bowl whisk the milk, eggs, vanilla, maple syrup, lemon zest, cinnamon and salt. Grease an 8-12 glass casserole dish with cooking spray. 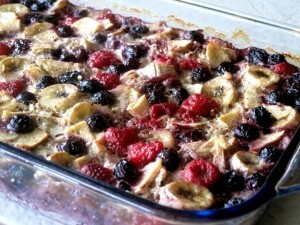 Arrange 1/2 of the prepared fruits on the bottom of the casserole dish. Using a spoon, place scoops for rinsed grains evenly over the fruit, to cover it as much as possible. Cover with the remaining fruits. Using a 1/2 cup measure, keep filling it with milk mixture and gently pouring around the inner edges of the casserole, then over the top, but not to disturb the contents, to prevent the fruit from floating to the top. Bake 50 minutes, or until the liquid is absorbed. 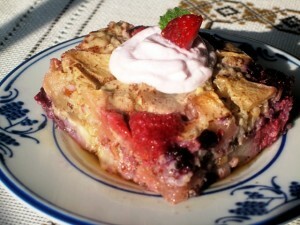 Cut into serving pieces and serve warm with yogurt and Maple syrup.